Both CAMFED and I are newbies to Chelsea Flower Show and we felt we really needed a steady pair of safe hands with loads of show experience. So in May 2018 I set about interviewing several landscape companies to get a comparison in approach and costs. 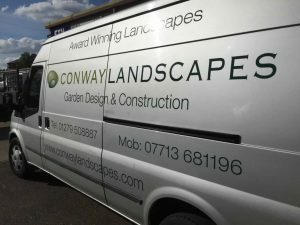 Conway Landscapes were duly appointed as our contractor as they are clearly addicted to building show gardens and, having built gardens at Chelsea and Hampton Court Palace since 2002, they have established a fantastic reputation. This will be their 20th show garden and they have been totally immersed, dedicated and involved with this project from day one. Cormac Conway and I have been working together intensely on this project – it’s been such a delight as we are on the same wavelength and are both totally committed and passionate about delivering CAMFED’s powerful message of female empowerment through educating girls in Africa. 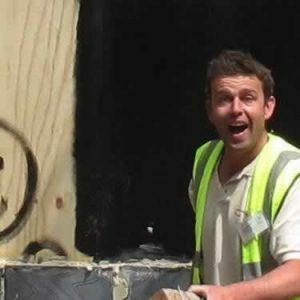 Cormac advised us to get ahead of the game by sourcing as many of the materials as soon as possible to take away from stress nearer the show date. 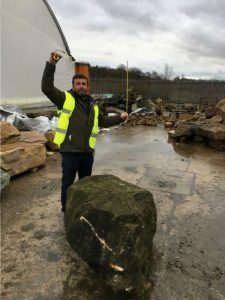 So far we have taken a trip to CED in Scotland to source the rocks and will be having our very own Rock Rehearsal in Essex to place them so that when they turn up to site we will know exactly where they are going – neither of us like surprises on site. Here we have mock up of a few walls with different renders and we are finalising the colour scheme. 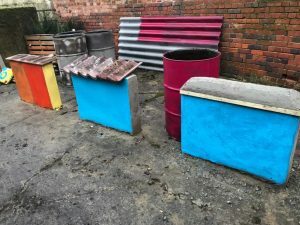 He’s been great at sourcing the oil drums too, and next up is the mock up of the tricky shelving unit which he is getting creative with. This guy is so cool and laid back, I really want to see him break a sweat and I’ve really tried to get him wound up but no luck. Consequently I am confident that he will be true to type during the build and it will all go very smoothly.